Just 9 ingredients and 25 minutes to make this amazing California Sushi Bowl! 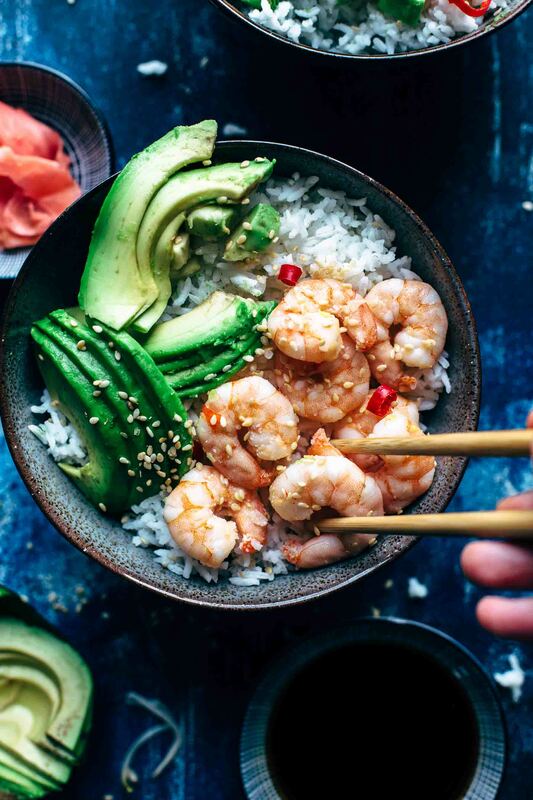 Shrimp – Avocado – Rice. Super delicious and super healthy. Just SUPERFOOD. This superfood bowl is inspired by the most popular sushi roll called California Roll which usually contains crab, avocado, and rice. Because this is also my favorite sushi roll, but I can’t eat at a Japanese restaurant every day, I started to make my own California Roll but even easier and faster. You don’t need a bamboo mat or any other fancy sushi equipment to enjoy this California Sushi Bowl. Either you don’t need to make any special sushi rice. Just keep it easy. 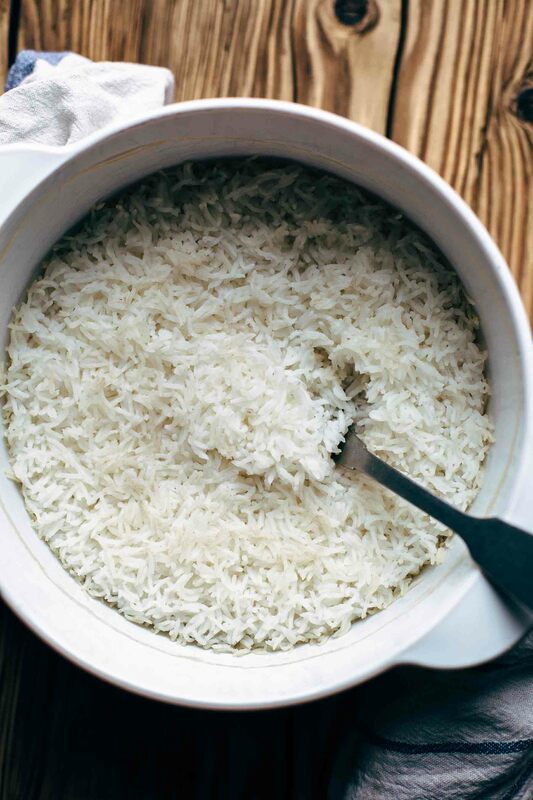 Use simple basmati rice for your California Sushi Bowl. The taste is perfect for such bowls. Because we are in the middle of spring weather (at least here in Austria), I want to keep up with healthy food here on my blog to get or keep you in shape for the upcoming summer season. It’s important to have a balanced diet for the most of your time. When you are eating tons of fresh, healthy and unprocessed food during the week, it’s ok when you enjoy your weekend with super moist Banana Bread or dense Peanut Butter Chocolate Cookies. We are just humans. 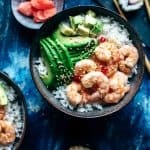 The whole point of this California Sushi Bowl is that you can enjoy delicious and healthy Japanese food without spending a lot of money or time in the kitchen. It is really that easy to make. But the best part of the show is that I will let you in on my secret “rice-cooking-way”. You will never cook rice in another way trust me. Turn on the oven. Then add rice with double amount of water and a bit of salt into a heavy bottomed pan and just bring it to a boil over high heat. Once it reached a boil, cover with a lid and transfer to the oven. You don’t need to stir or watch the rice. Put it in the oven and forget it……for the next 20 minutes. Fry shrimp in sesame oil with garlic and chili. Then roast sesame. 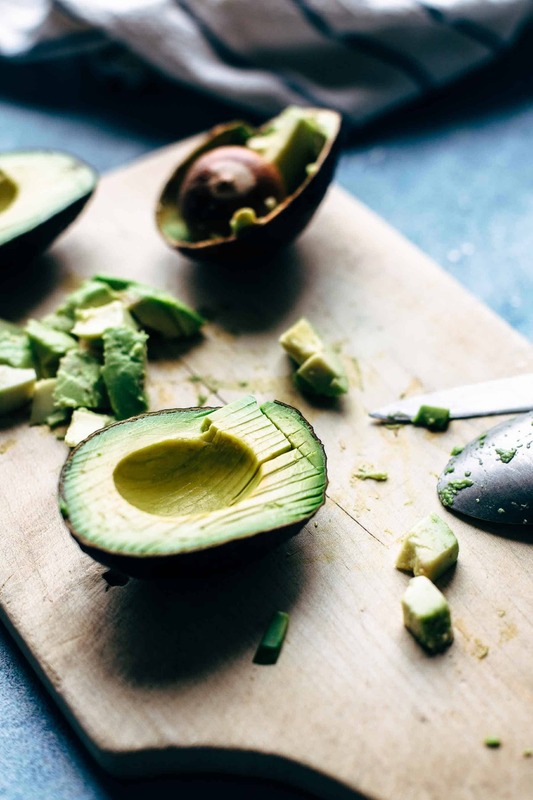 Cut avocado into thin slices. That’s all for you to make. You can enjoy it warm or cold. This is the perfect make-ahead lunch because it lasts one day in the refrigerator. As promised I’ll show you just GREEN food the whole week because of St. Patricks Day on Friday. So this is recipe No. 2 out of 3. Pesto Genovese was recipe No. 1. As you assumed, green food refers to healthy food in most cases. But be curious about recipe No. 3 which isn’t healthy food at all. So stay tuned. 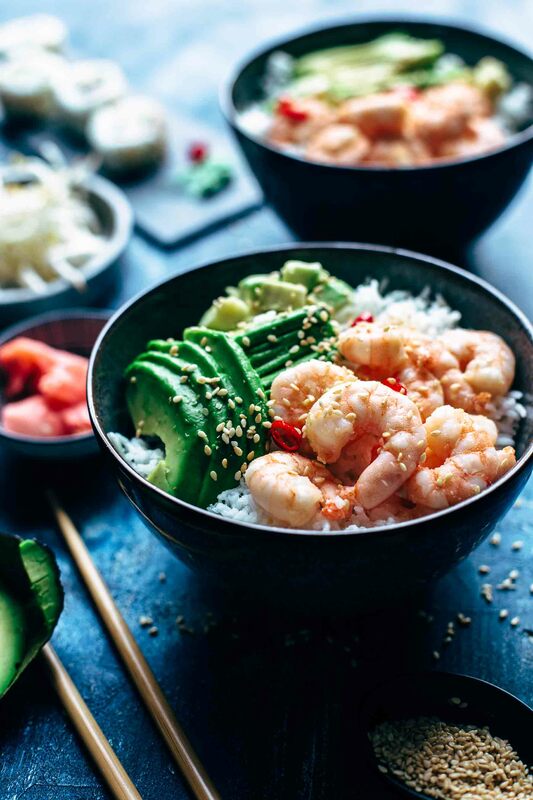 If you try this super easy and delicious California Sushi Bowl recipe leave a comment, rate it and tag a photo #alsothecrumbsplease on Instagram! I would love to see your bowl! Preheat oven to 395°F (200°C). Add rice, water, and salt in a heavy bottomed pan. Bring rice over high heat to a boil. Once it reached a boil, cover the pan with a lid and transfer to the oven. Cook for 20 minutes. Meanwhile, mince chili and garlic finely. Slice avocado thinly. Set aside. Saute sesame seeds in a large frying pan over high heat until lightly browned for about 1 minute. Remove sesame seeds from pan. Set aside. 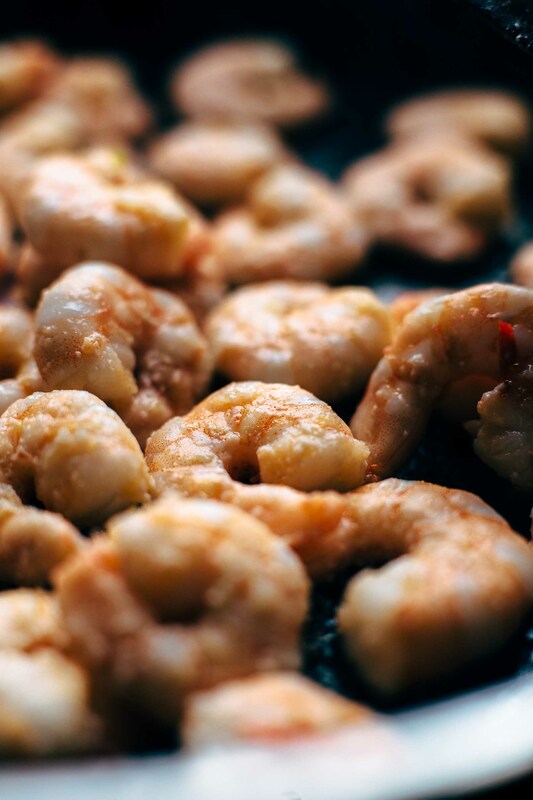 Place sesame oil and shrimp in the pan and cook for about 3 minutes over high heat until the shrimp are getting white. Then add garlic and chili and cook additional 1 minute. Season with salt. 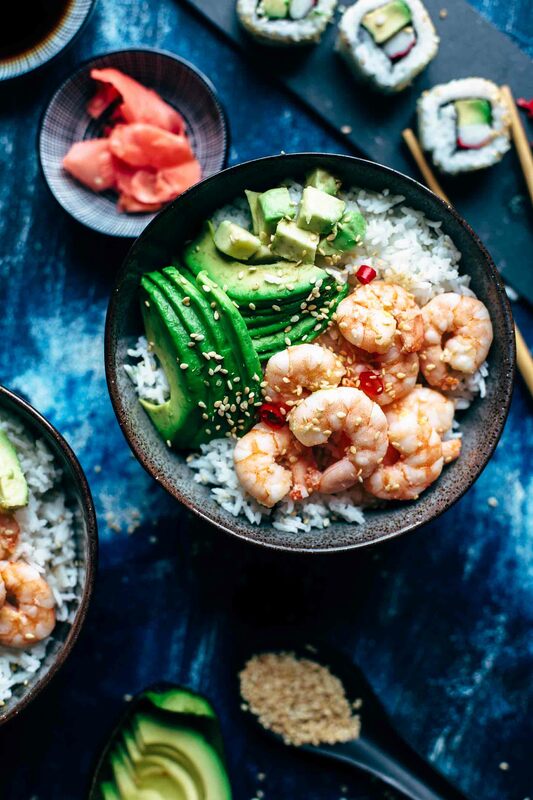 Arrange rice, avocado, and shrimp in a bowl and sprinkle with sesame seeds. Serve with soy sauce. Enjoy warm or cold. Make ahead tip: Prepare the day before and store in the refrigerator for up to 1 day.